Textured artwork is easier to edit and tweak on vector layers, as you can manipulate textured brush strokes with the Select Tool, the Contour Editor and the Centerline Editor. Very texture-heavy artwork may turn out to be lighter, both in terms of performance and file size, on a bitmap layer than on a vector layer. Erasing textured artwork with a textured eraser will look more natural on a bitmap layer than on a vector layer—see Creating a Textured Eraser. NOTE Should you choose to draw on bitmap layers, or to draw on vector layers with textured brushes, you should mind that your artwork will be resolution dependent. By default, the pixel density of bitmap and textured artwork is 100%, meaning that zooming in or scaling up your artwork will make it appear pixelated. To increase the pixel density of your artwork and prevent it from appearing pixelated, see Setting Textured Vector Brush Resolution if you are working on a vector layer, and Setting the Resolution of Bitmap Layers if you are working on a bitmap layer. 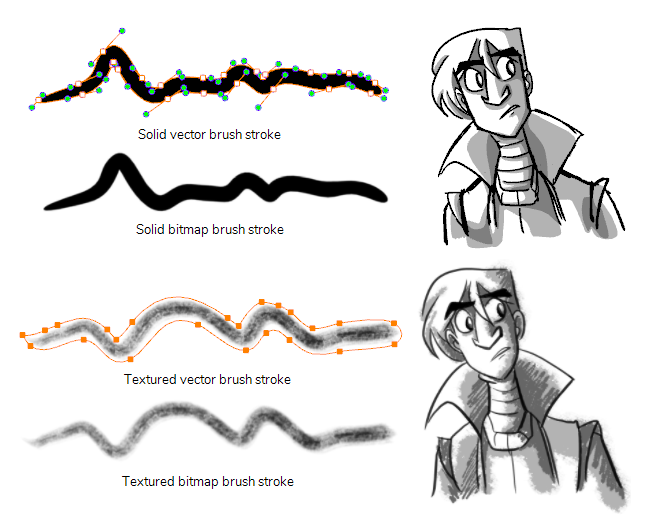 NOTE To learn more about the options of the Brush tool, see Brush Tool Properties.